I am shocked by how many people tell me that they don’t have time to make new friends. Their lives are filled with work, keeping up with kids’ activities and schoolwork, and everything that goes along with being an adult. And yet, I also hear from so many, both online and in person, that they’re lonely. They wish they had friends to hang out with. Friends they can lean on in difficult times. Friends who know them inside and out. Maybe that’s you. Maybe between work, home life, responsibilities, and evening activities, you feel like you don’t have enough time left to invest in friendships. But you’re lonely. You miss connecting with friends. You see people all day long, but you don’t feel seen. I get it. Being the mom of four kids, my life is busy, too. And I’ve been in that lonely spot before. What I know is this: you and I are wired for connection. We need good friends. We need to feel known, to share life together, and to belong. Studies show that friendships are good for your health and help you live longer. But are you making the time to invest in them? How long has it been since you sat down with a cup of coffee to catch up with a close friend? Or met up at a park to visit while the kids play? Or invited someone over for dinner? Have all of your responsibilities and activities pushed time for friendships right off your calendar? 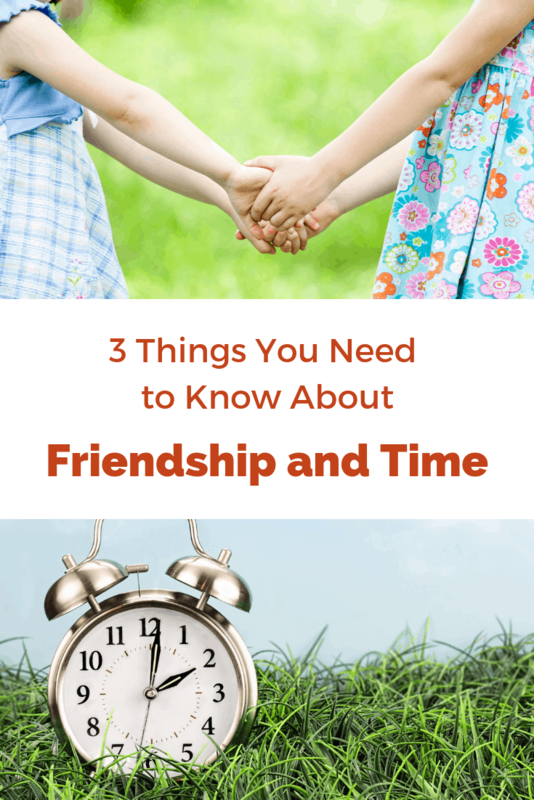 Today I’m going to share with you 3 things that might change the way you think about friendship and time. Building a close friendship takes a lot of conversations, shared experiences, and time. In college, I roomed for 4 1/2 years with my friend, Laura. We actually didn’t know each other when we agreed to be roommates, but after one month of living together, we became joined at the hip. We hit it off right away, but it was going to all of the freshman mixers, navigating the cafeteria together, Friday afternoon 70s dance parties, and late night conversations that built our friendship. We wouldn’t have become close friends so quickly if we hadn’t spent all that time together. And time spent together is one of the biggest factors in building a close friendship. A professor at the University of Kansas decided to research how many hours it takes. Are you ready for this? It takes 200 hours to build a close friendship. 200! That makes sense when I think about my friendship with Laura and my other college friends. We easily spent 60 hours a week together, so our friendships were fast-tracked in a way. But now that I’m older and have more responsibilities, that number discourages me a little. How in the world am I going to find 200 hours in my busy life to build a friendship? No wonder it feels so hard to make close friends as an adult. Do you feel that way, too? What if, though, instead of letting that 200 hours discourage you, you used it to motivate you to be intentional about planning time with friends or with the people that you want to become friends with? How busy are you really? Sociologist John Robinson has spent 40 years studying time and quality of life by having people keep time diaries and analyzing them. What he’s found is that while you may feel busy running from one activity to another, everyone has at least 30 hours of leisure time each week. Don’t believe him? Try keeping a time diary yourself for a week. Write down what you are actually doing each hour of the day, and at the end of the week, count up how many hours you spent on leisure activities. Or just think about all of the things you do in a day that could be counted as leisure. 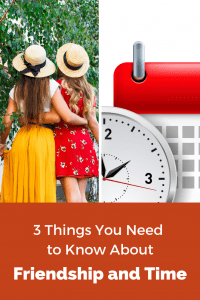 Basically, leisure, according to Dr. Robinson, is any uncommitted time that doesn’t fall under work, family care (housework, child care, shopping, etc. ), or personal care (sleeping, eating, or getting dressed). What I’m trying to say is that while you feel busy, if you’re honest with yourself, you can actually find pockets of time that you could spend with a friend. And if you were to make a list of all the activities in your life that refresh you or fill you up, I bet connecting with a friend would come higher on the list than scrolling through Facebook or Instagram. If you truly wish you could find the time to get together regularly with a friend, I have the solution. It’s not necessarily going to be easy — you’ll have to work at it. And your friends will have to work at it, too. 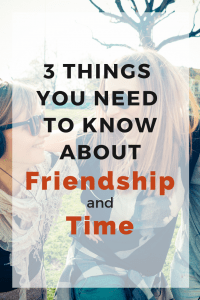 Wanna know the secret to finding time for friends? It’s making friendships a priority. That’s what it takes. If you’re ever going to make a dent in those 200 hours it takes to make a close friend, you’re going to have to prioritize those relationships. That means thinking about what you truly value. It means being honest with yourself about how you’re spending your time. It means creating some margin in your life so that you have room in your schedule for your friends. No one else is going to give you more time. You have to make it yourself. That’s the secret to finding more time for friends. What are my top 4-5 priorities or values? Do friendships or close relationships fall in those top 4-5? How much time am I giving to friendships right now? What could I say “no” to in order to have more time for friends? If friendships are a priority to you, make a choice to invest in them even if you feel busy. Make that lunch date. Invite your friend and her family over for dinner. Follow up one of those We should get together‘s with an actual date you’re free. Start using some of that leisure time in your week towards the 200 hours it takes to make a close friend. Make friendships a priority, put in the effort, and build some friendships. I promise it will be worth it. I love this! One of my pet hates lately is those memes that say things about friends you never keep in touch with but you still love, and aren’t those low-maintenance friendships are great. What that says to me is “I don’t care about you enough to put the time in.” Friendships DO take time, and friends are worth it.